Fall is here and that means it's time to watch football! And what's better than watching your favorite team pull off an incredible win? Watching your team win with friends at a log cabin in the mountains of course! In Pigeon Forge and the Smoky Mountains, we've seen a growing trend of visitors hosting cabin football parties as part of their vacation. 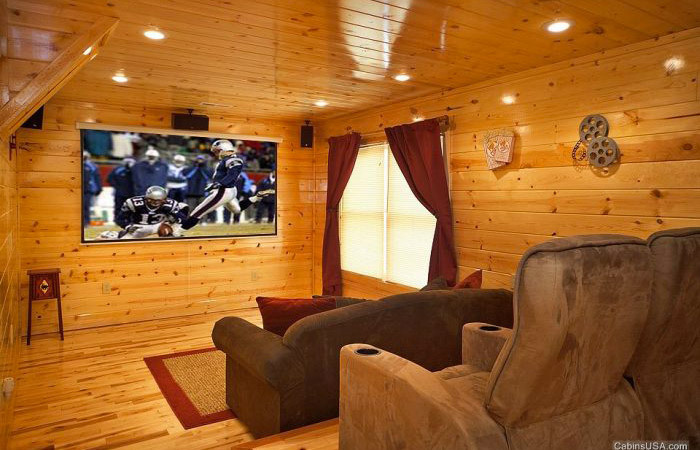 After all, true fans hate to miss their team compete, so why not reserve a log cabin that's perfect for watching football? To help you get the most fun out of a game day, we've made this guide on why to book a cabin for your football party and how to find the right rental for your trip. Watching NFL or College Football is always more fun with a big group of friends, so why not book a large group cabin so everyone can watch the game together? Our large luxury lodges can accommodate over 20 guests and they have plenty of space for everyone to enjoy a football party in the Smoky Mountains. Unlike a hotel room, cabins in the mountains typically come with fully-equipped kitchens and grills, so you can make your favorite game day snacks like hot wings, burgers, or a decadent, 7-layer nacho dip. 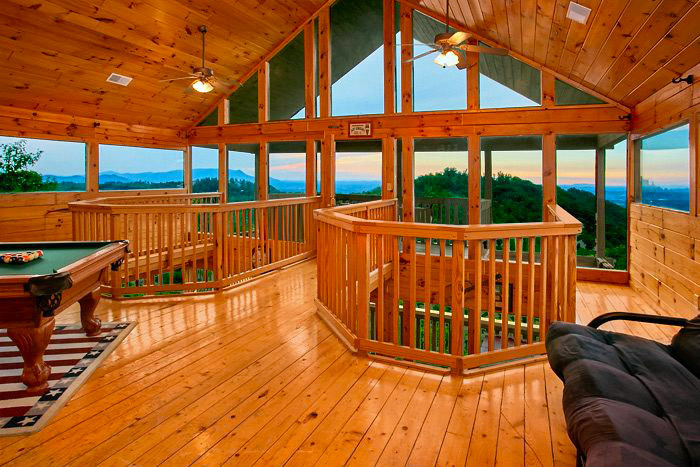 Many cabin rentals come with game areas with flat-screen televisions, comfortable seating, and pool tables that are fun places to watch your team play. Better yet, some of our cabins boast wet bars in their game rooms. Having a wet bar means you never have to step away from the big game, so you can cheer your team on through every heart-pounding moment. Along with a mini-fridge or a small kitchenette, you'll love not having to stray far from the big game to grab a snack or a refreshing beverage. Large projector screens, surround sound systems, and theater style seats – need we say more? Several of our luxury cabin rentals come complete with home theater systems that are ideal for watching the big game in comfort and style. These rentals with media systems are popular places for enjoying football, so be sure to book your cabin vacation well in advance if you’d like to stay at a cabin with a theater room. Sometimes it's hard to believe, but not everyone loves watching football. Luckily, our cabin rentals come complete with other relaxing amenities like hot tubs, resort pool access, and game rooms to keep other guests entertained. From hiking in the national park to shopping at Tanger Outlets to visiting Dollywood, there are tons of ways to keep your group entertained if they'd rather not watch the game. If the game doesn't go your way, at least you'll be in the exciting and beautiful Smoky Mountains area. After all, there's nothing like going to enjoy gorgeous Smoky Mountain views in the national park, riding roller coasters at Dollywood, or seeing a hilarious dinner show to take to take the edge off a disappointing game. If you're interested in planning your own cabin football party for the Super Bowl or a big rivalry game, be sure to contact our helpful reservations staff at (865) 429-4121 so we can help you find the perfect cabin for your celebration!